Ontario has signalled its intent to remain among the energy efficiency leaders in North America for new building construction in adopting American National Standards Institute/American Society of Heating, Refrigerating, and Air-conditioning Engineers/Illuminating Engineering Society of North America (ANSI/ASHRAE/IESNA) 90.1-2010, Energy Standard for Buildings Except Low-rise Residential Buildings. When the six-year ‘roadmap’ for energy efficiency expired on December 31, 2011—as set out by the Ontario Building Code (OBC) and relative to the dated 1997 Model National Energy Code for Buildings (MNECB)—a new path was laid out for the future. Ontario Regulation 315/11 was made under the Building Code Act to require energy efficiency for large buildings and small non-residential buildings conform to an updated Supplementary Standard SB-10. achieve energy efficiency levels attained by conforming to ASHRAE 90.1-2010, as modified by Supplementary Standard SB-10. The latter option is the only one that does not require energy modelling. This prescriptive method of achieving compliance includes more than 40 lighting addenda—as compared to the 2007 version—and has made ASHRAE 90.1-2010 one of the most modern energy efficiency standards available. It has also fundamentally modified its scope beyond just design and construction to energy-efficient operations and maintenance. 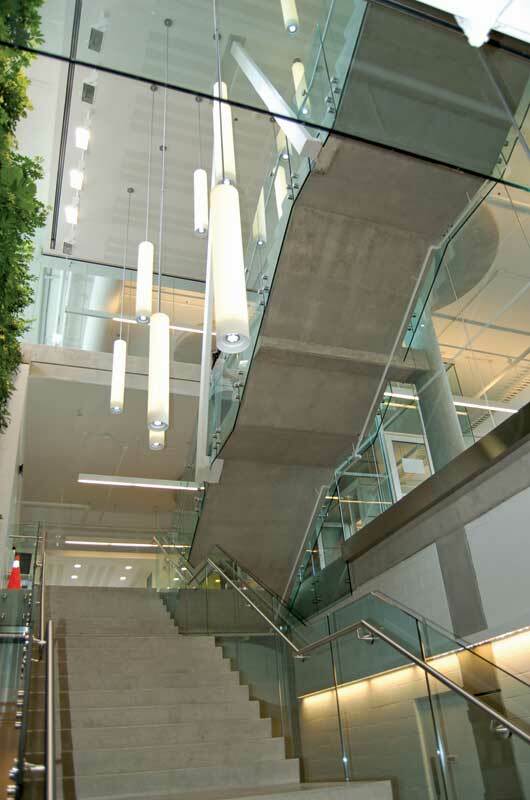 Mohawk College in Hamilton, Ont., contains energy-efficient lighting, daylighting, and a green wall. Lighting systems will continue to feel downward pressure on power densities, with the general expectation that solid-state light-emitting diode (LED) technology will continue to provide necessary efficacy improvements. However, while power density reductions were imposed both indoors and out, lighting controls are the major focus of extra energy efficiency requirements. In fact, plug load controls are a completely new addition to capture the increased use of task lighting and other plug-in electrical devices. There are two approaches to achieve compliance with the interior lighting power limits detailed in ASHRAE 90.1-2010—calculation of total load (measured in Watts per square foot) using either the building area method or the space-by-space method of calculation. These are fairly common practice today with the former being a simplified approach, and the latter providing additional flexibility. Changes to the building area method lighting power densities (LPDs) have averaged a 16 per cent reduction as the limits for many building types have been lowered, or at least maintained. General advances in lighting technology are expected to make up this difference. Space-by-space LPDs, on the other hand, have been reduced for some areas to account for lighting technology improvements (e.g. retail applications are expected to benefit from improvements in ceramic metal halides [CMHs]), but some are also increased to make corrections to previously set limits. Lighting designers will feel some relief when designing for higher ceilings and longer perimeter wall applications through a room geometry adjustment. If the space-by-space calculation method is used, a 20 per cent LPD increase is available provided the room cavity ratio exceeds the established threshold for the space type. For example, any corridor narrower than 2.4 m (8 ft) automatically meets this threshold and is afforded the 20 per cent increase in LPD. Additional LPD allowances can also be achieved by implementing lighting control strategies above and beyond mandatory requirements. Renovations will fall under the scrutiny of LPD calculations more often now that any lighting alterations of more than 10 per cent of the connected lighting load in a space must also comply and meet automatic shutoff requirements. Lamp or ballast retrofit projects are also now included. To better control exterior lighting use, a new five-zone power allowance table has replaced the single set of exterior lighting power limits. The zones represent the relative development of the site under consideration; for example, whether the local environment is undeveloped park land or rural area, predominantly residential, or a high-activity commercial district. Each zone is afforded a base amount of lighting power, then provided an allowance for lighting of various surfaces from parking to entrances to building façades. The zone approach keeps outdoor lighting power in check and appropriate to the surroundings. 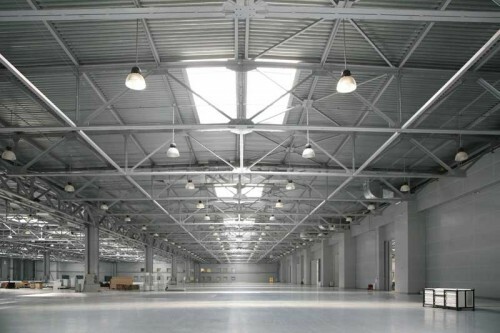 Some trading of lighting power allowances is permitted as long as the result is below the combined total limit. Notable exceptions include directional signage and advertising lighting, as well as feature lighting for historic buildings and landmarks. Exterior lighting is impacted by the general increased reliance on controls. Automated controls will be required to turn lights off during the day, as is common practice today. However, OBC also mandates some restraint for façade and landscape lighting to be shut off between the latter of midnight or business closing and the earlier of 6 a.m. or business opening. The biggest change requires all other exterior lighting, including advertising signage, to be automatically reduced by at least 30 per cent after hours or when unoccupied. Parking garages, indoor or out, are significantly impacted by this requirement. Dimming technology may prove to be very important in this category. A bi-level switching study shows auto-on to 50 per cent is the most energy-efficient. 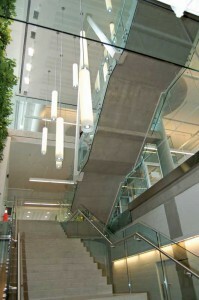 Lighting controls play an increasingly important role in reducing wasted electricity indoors. Manual on-switching of bi-level lighting is now the standard to ensure the adequate light level is used only when required. Occupancy sensors are more likely to be referred to as ‘vacancy sensors’ since all automatically controlled lighting must now have manual-on functionality with automatic off-switching. 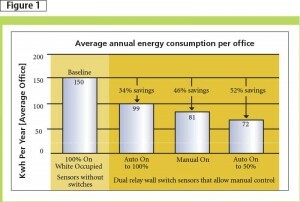 In contrast to the common occupancy activated on- and off-switching, this method provides additional energy savings. 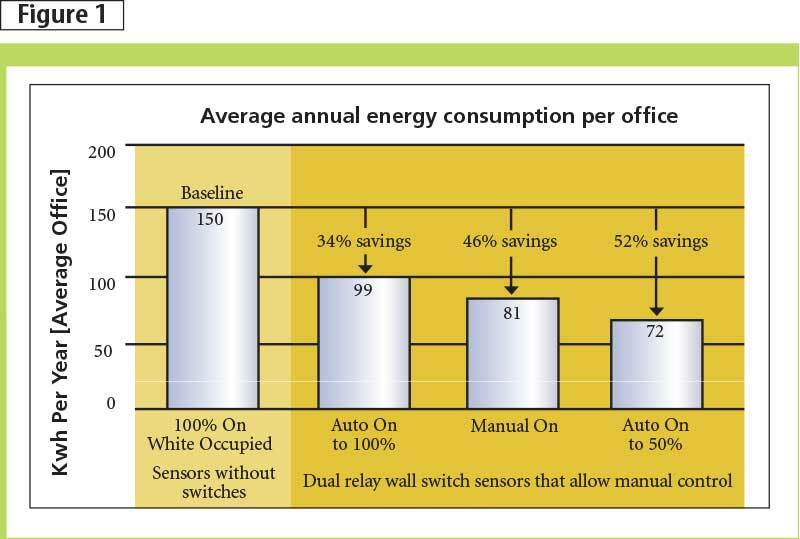 In fact, the preference is to automatically switch lighting on to 50 per cent power and manually switch the remaining 50 per cent as this method is proven to generate the greatest energy savings (Figure 1). dressing, locker, and fitting rooms.